- and now use Excel's XIRR function for anual returns. If it is not a full year I then adjust XIRR by the PRR (Personal Rate of Return) = [(1+XIRR Annualised Return)^(# of days/365)]–1. In those post I also used incorrect weightings for the benchmark portfolio. It should have been 72% stocks/28% bonds as per here. Apologies for the confusion but I'm learning here too. 2008 was a bad year for my investment portfolio and by year end the 02 January 2009 I was -19.7% -15.7% using [assets at end of period – assets at start of period – new money entering portfolio] divided by [assets at start of period] as my return calculation method. 2009 also started badly and at one point in March my portfolio was -12.4% and we weren’t even a quarter of the way through the year. As everyone knows the markets then started recovering and I rode the wave to end the year at period 02 January 2009 to 31 December 2009 at +21.5% +24.9% including fees. My fees are currently running at 0.6% so excluding fees it’s 22.1% 25.5%. 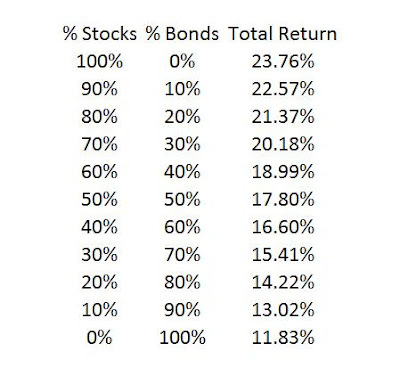 With my current asset allocation I am predicting an average return after inflation of 4.2%. With the UK Retail Prices Index (RPI) currently at 0.3% I therefore needed 4.5% to ‘break even’ so all in all a good year when compared with this.